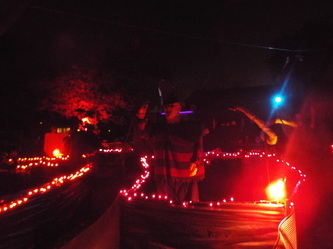 Nightmare on Newport is one of the Horror Tourer favorites. 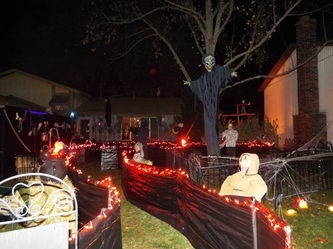 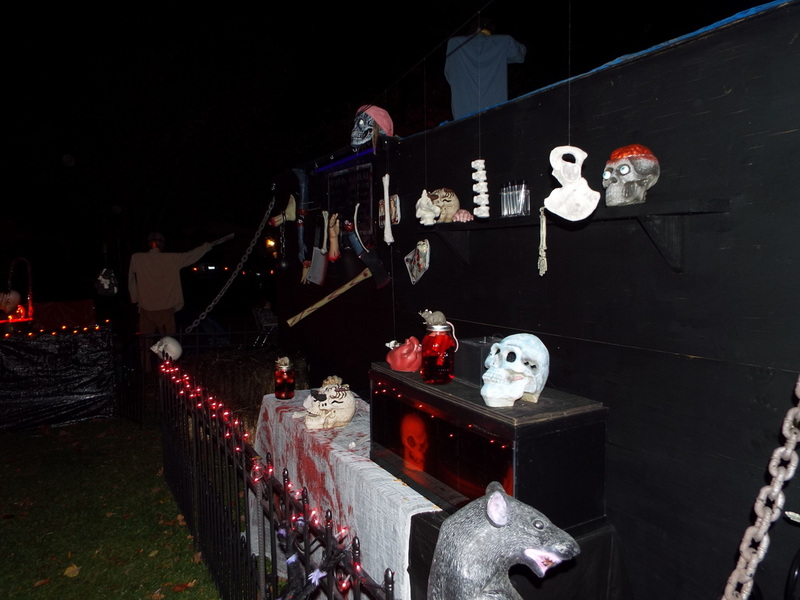 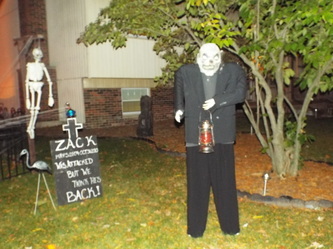 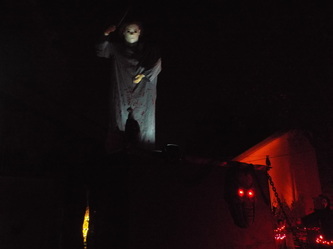 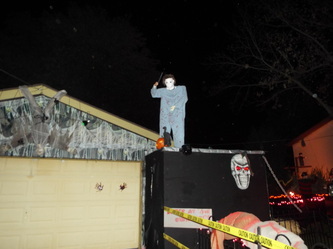 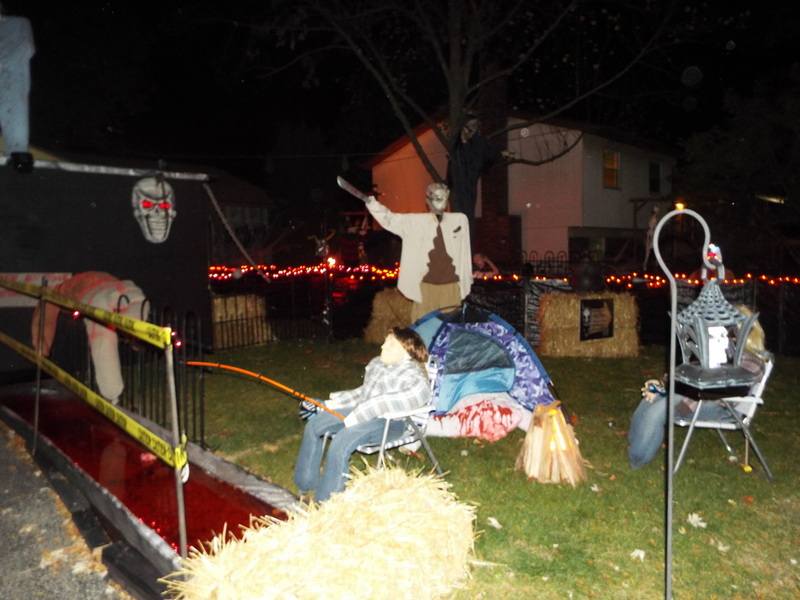 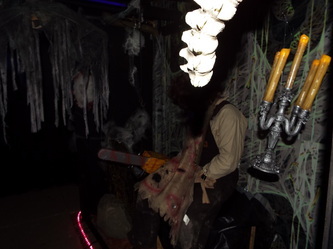 Located in Oak Forest, which is home to a large number of excellent home haunts and yard displays, Nightmare on Newport is a yard display and small walkthrough that focuses primarily on movie monsters. 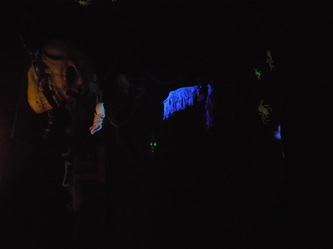 Each year the display has grown to incorporate more movie monsters, and often features a few live actors as well. This year, the display featured a campsite being attacked by Jason Voorhees, alongside a river of blood, which was a new addition. 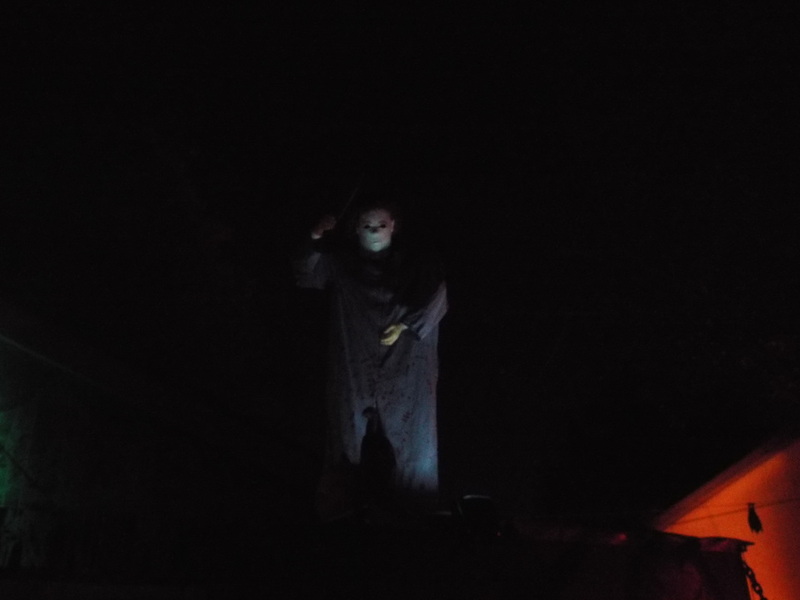 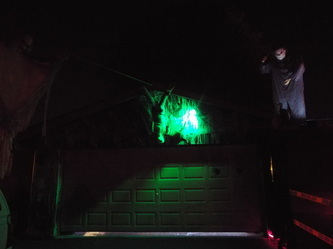 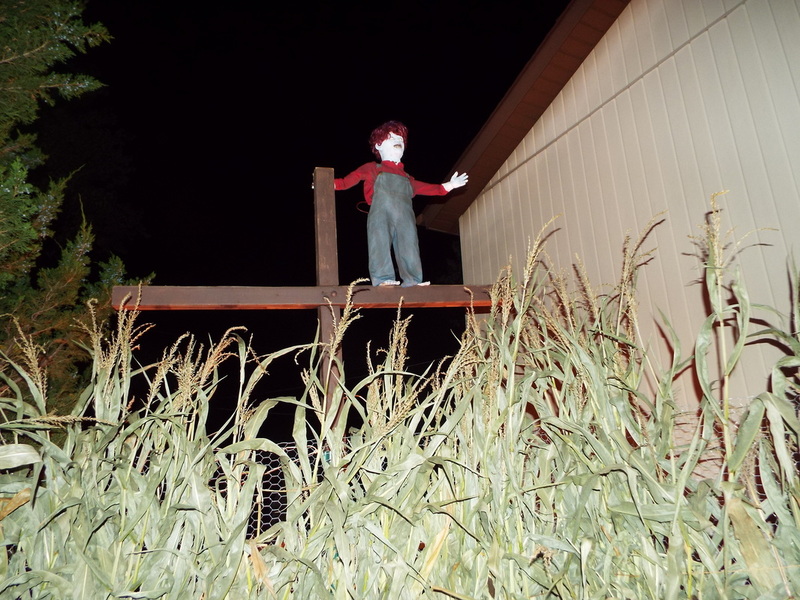 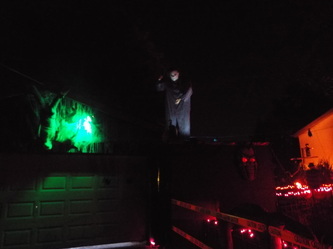 The garage was covered in giant spider webs, and, as usual, a giant figure of Michael Myers towered over the front of the yard. 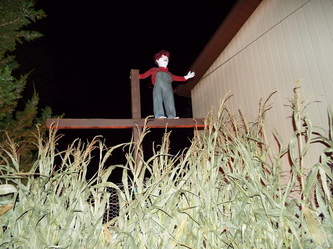 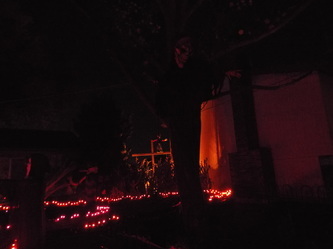 The difference this year was the Michael stood on top of a small covered walkthrough portion. 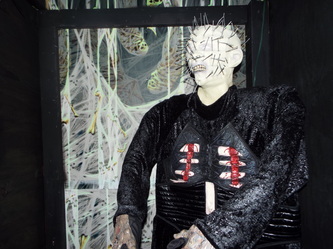 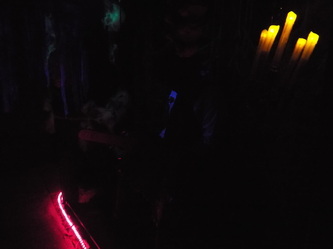 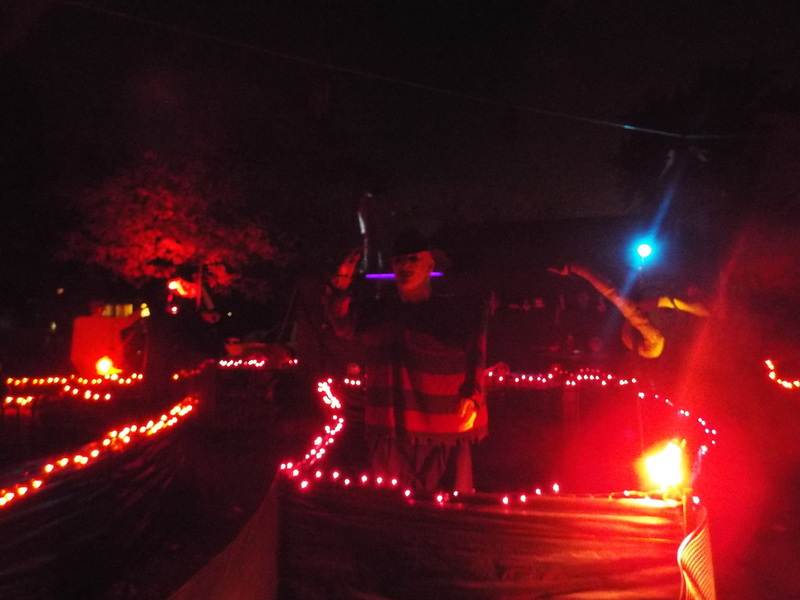 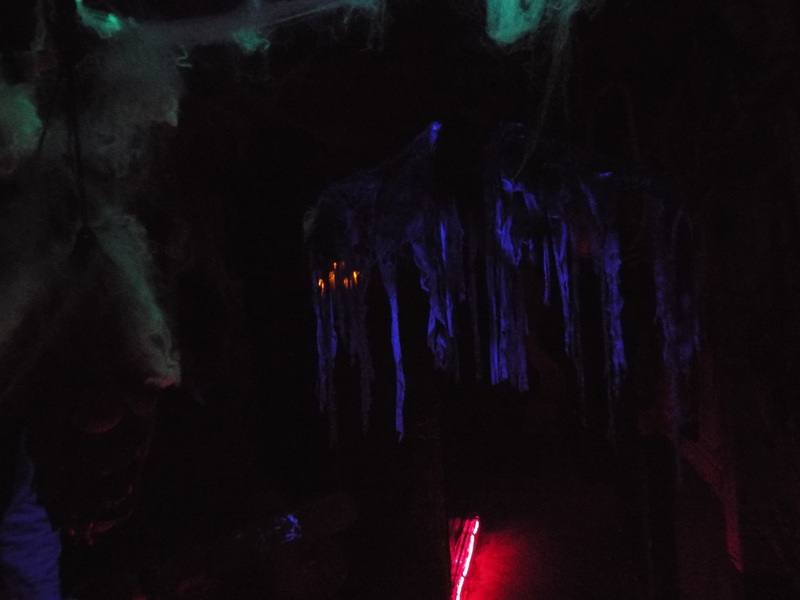 Visitors had to pass through glowing spiders and webs, and found themselves face to face with Pinhead from the Hellraiser movies, as well as Leatherface. While Pinhead was simply a life size figure, Leatherface was a cleverly disguised live actor, who not only jumped out to give visitors an initial scare, but also silently followed visitors through the front yard as they looked at the various displays. 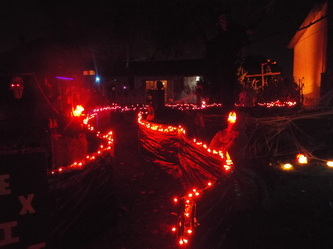 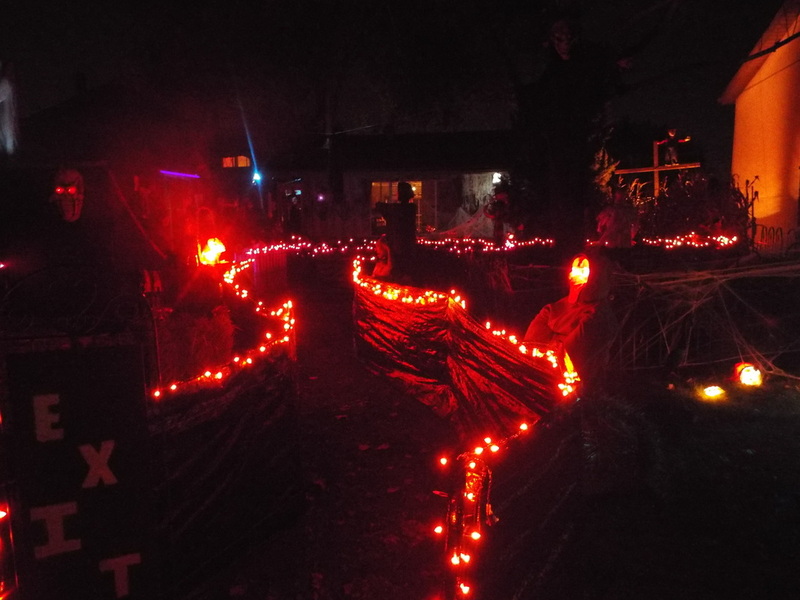 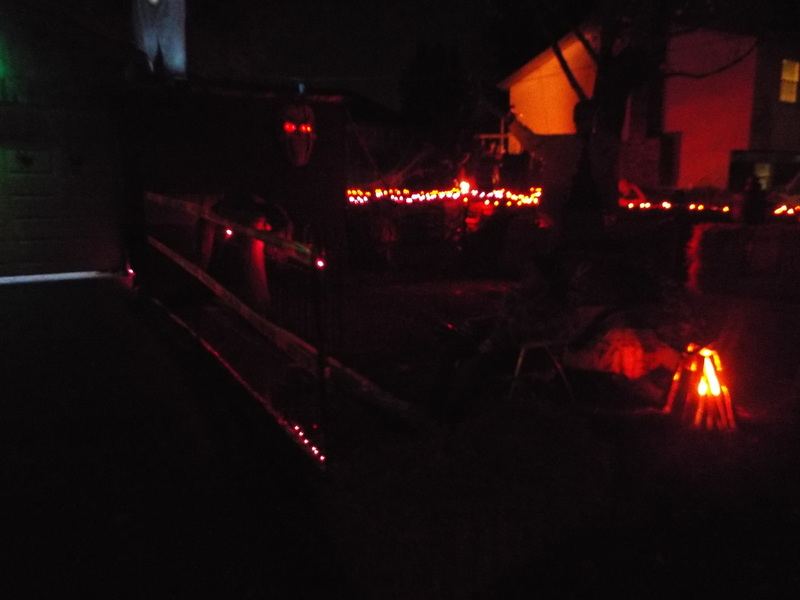 Following this covered portion, visitors were able to walk through the front yard, but only in a specific pattern outlined by red lights. 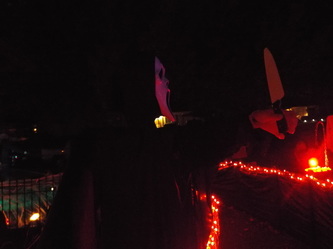 Along the way were scenes featuring Chucky, Freddy Krueger, and Ghostface, as well as other original creations. 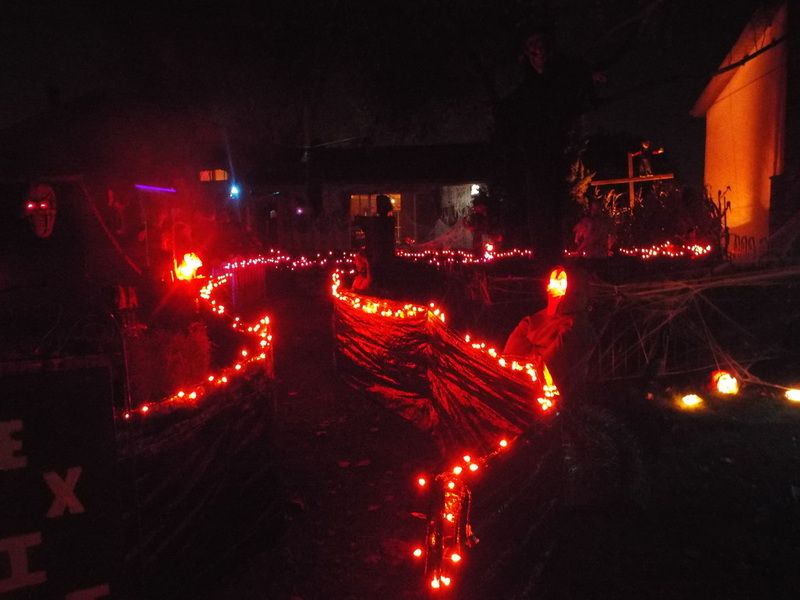 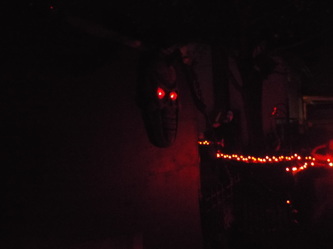 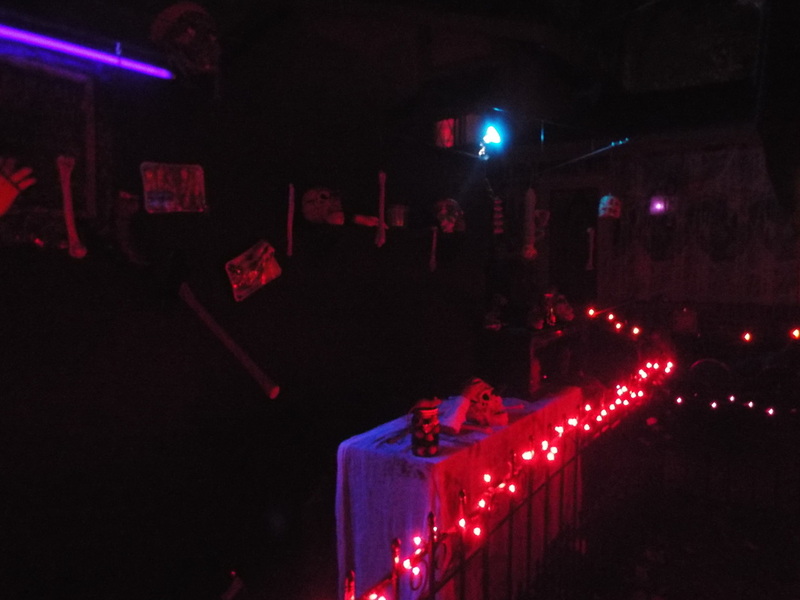 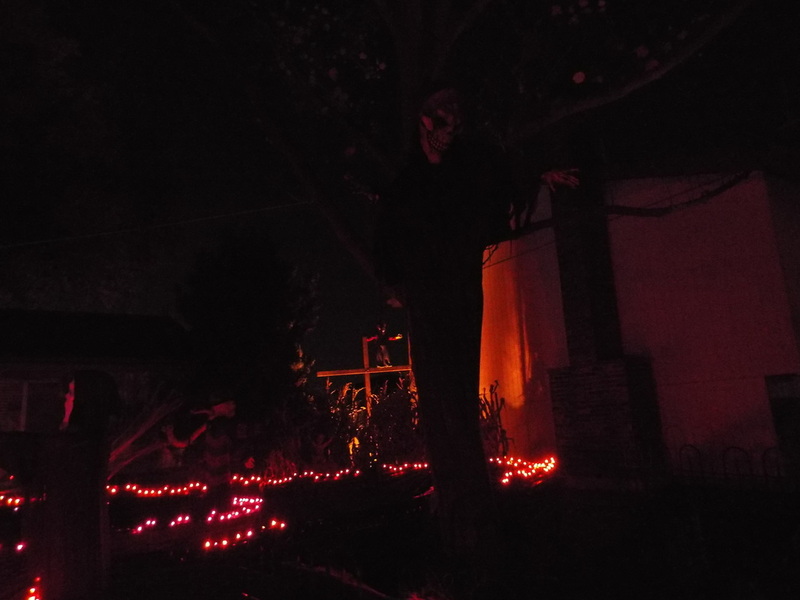 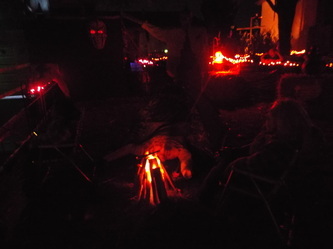 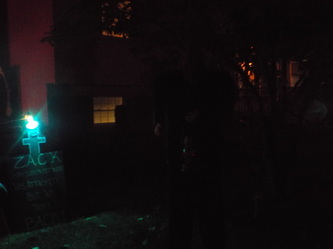 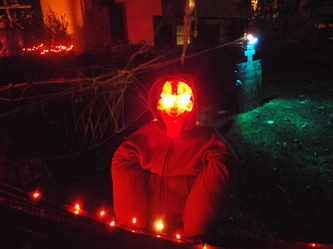 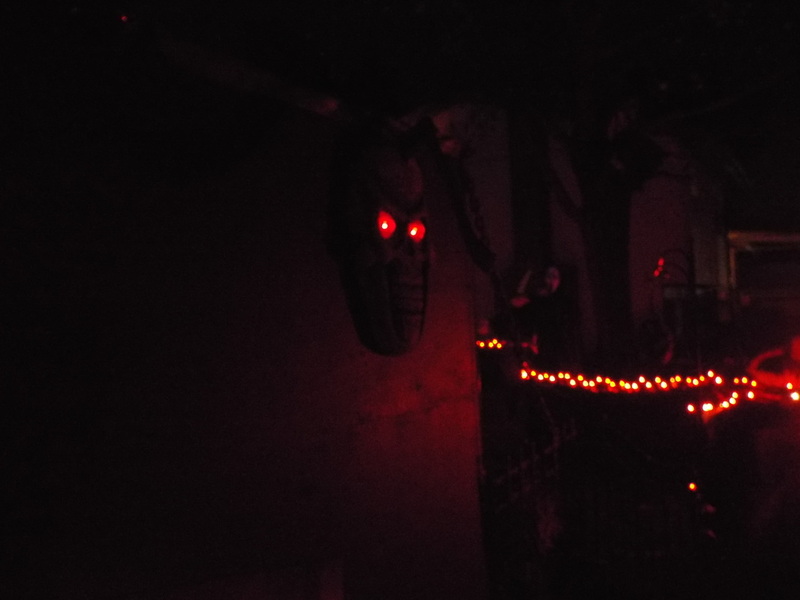 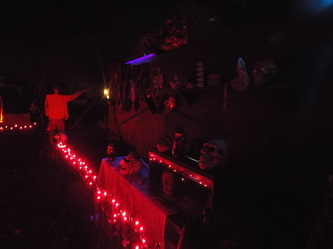 The eerie red lighting and black plastic bags that lined the trail through the front yard created a creepy atmosphere and allowed for many hidden areas for live actors to pop out of. 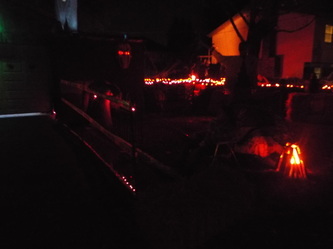 Overall, it's a small but effective setup that creates the feeling of constantly being watched while moving through it. It's got a great old school feel to it - it's not elaborate but it's very enjoyable to see, with effective lighting, creative setups, and some great live actors. It's one display we make a point of seeing each and every year. 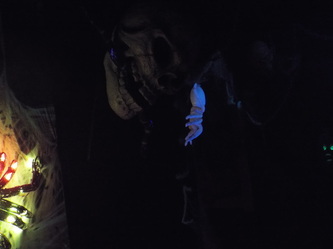 We have heard that the display will expand in 2014 with an even larger home haunt portion. 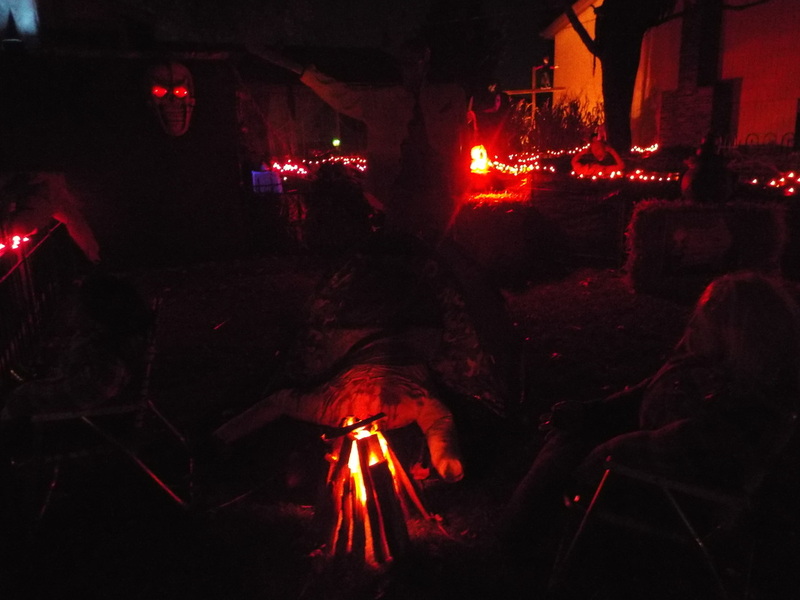 We eagerly await what's in store for next year!